You might have noticed that I put a lot of ginger in my recipes. It’s not just because it tastes good and is my secret trick to hide the taste of greens and other produce that aren’t so palatable. It’s also because it’s super good for you. It’s one of our best friends for hiding taste and adding nutrition. I’ve done a little digging to compile the latest health benefit- and it’s no surprise why it’s been used medicinally for thousands of years. Take a look at why I’m always including this root in my juice and smoothie recipes, at least a few times a week. 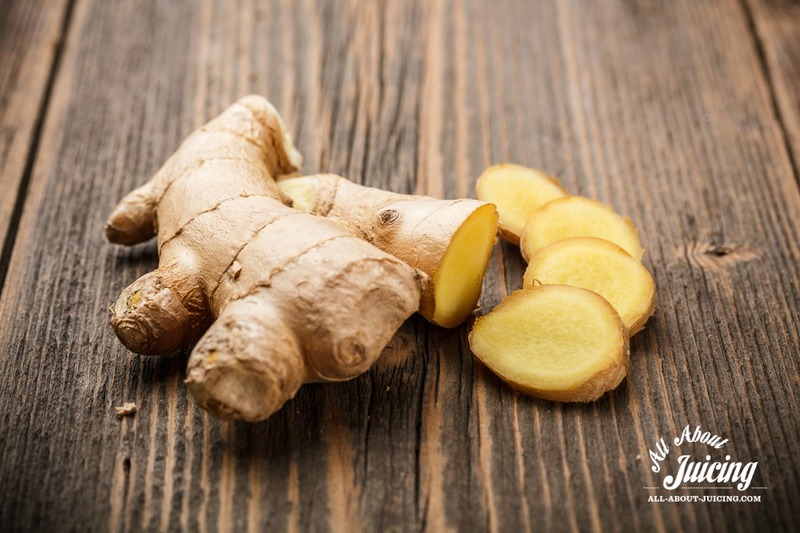 A favorite ingredient in traditional Asian and Asian-inspired dishes, ginger root also has a long history of use as an herbal remedy for excessive intestinal gas and certain other symptoms of gastrointestinal distress. Although ginger only contains insignificant traces of vitamins, minerals and other nutrients, modern research has verified that it does have several health-benefiting properties. For example, several recent studies confirm that it can help prevent or alleviate the unpleasant nausea, vomiting, cold sweats, and dizziness that are associated with motion sickness – seasickness in particular. Research has also shown that ginger is effective in reducing the nausea and vomiting that are associated with pregnancy, without any risk of significant side effects that may harm either the fetus or the mother. This root also has antioxidant and anti-inflammatory properties. Compounds called “gingerols” appear to be responsible for both. Research confirms that many arthritis sufferers have better mobility, less swelling in their joints, and less general joint pain after adding ginger to their diet for several months. Among other things, ginger has been shown to suppress the production of compounds that promote inflammation in and near the joints. The antioxidant properties exhibited by gingerols may also be responsible for part of the improvement seen in arthritis patients. Antioxidants help protect the body from the effects of free radicals, which are known to damage cells, organs and other tissues – potentially including the tissues comprising and surrounding joints. According to research conducted on mice a little over a decade ago, gingerols may also suppress the growth of colon cancer cells. A different study found that gingerols may kill ovarian cancer cells. A recent German study discovered that sweat contains a powerful antimicrobial compound that might help fight off certain fungal and bacterial infections. Because it can help induce sweating, this discovery means that it might provide some protection against skin infections caused by Candida albicans (a common species of yeast which lives on the skin), Staphylococcus aureus (a species of bacteria that’s responsible for many skin infections) and certain strains of Escherichia coli. Ginger is pretty powerful and very potent. When adding it to juices or smoothies, you just want to add a little knob. You'll have to start slow by testing out the amount that you like, but most people like to juice or smoothie about half and inch. You can add more to smoothies because it not as strong (taste wise) when it's blended. Have you seen these juice shots in juice bars? Making a shot is a great idea if you do it right. Drinking ginger alone is doable, but isn't ideal. It also doesn't yield much juice, and a little does go a long way. Mixing it with lemon and apple are my choice for a anti-inflammatory, immune boosting shot. This is great for circulation, nausea, and if you're coming down with something and feel ill.
You'll need a juicer to make this juice shot. Core and slice the apple. Slice a lemon in half. Juice the ginger, apple, and lemon together. Serve. Add honey and apple cider vinegar and mix, if desired. These ingredients add an extra nutritional boost, but is not needed. The shot will be powerful and strong, but that is the point. It will give you an added boost of nutrition to your diet and your day. Enjoy! If you don't have a juicer or a blender, or want to switch it up, make homemade ginger tea. All you need to do is cut a few small pieces of fresh ginger and place it in the bottom of your mug. Pour boiling water over it and let it steep for a good 5 to 10 minutes. Remove the ginger, add stevia or honey to taste, and serve.